Calculating ROI on the customer experience typically takes the blind faith approach, where ROI on customer service is considered a given, and the sophisticated approach, where predictive models explain the links between service attributes, customer satisfaction and profitability. Such models can, in fact, be valuable as a means for understanding the associations among different service and profit factors. They can also provide insight into how service attributes interact with each other to influence customer perceptions. A major drawback, however, is that these models tend to have too many moving parts to function as a practical, day-to-day business tool, give the appearance of being far more precise than they actually are, and may be too sophisticated for some audiences. Sometime managers need a simpler, more intuitive approach to estimating ROI on customer service. First let me suggest the proposition that every time a company and service provider interact the customer learns something positive or negative and adjusts their behavior, again positive or negative based on what they learn. This is a behavioral approach to managing the customer experience, that by managing customer behaviors in profitable ways, service providers can maximize return on investment in the customer experience. Using this behavior approach as a model, it possible to construct a simple intuitive ROI estimate of the customer experience. The first step in this methodology is to list all customer behaviors that directly drive revenues or costs. Ask yourself, “What specifically, do we want customers to do more or less of?” Don’t include attitudes, such as satisfaction, or feelings such as delight – only include empirically measureable behaviors such as purchase more, purchase more frequently, call for support less often, use more profitable channels, return merchandise less frequently, etc. Before moving on to the next step, review this list and eliminate any customer behaviors that cannot be influenced through service interactions. Next, work backwards making a second list of specific , measureable service attributes that likely influence desired customer behaviors. This list should only include attributes for which there is a realistic cause and effect relationship between the service attribute and customer behavior. Ask yourself, “What can we (across all service channels) do more of, less of, or do differently to influence customer behaviors?” If it can’t be measured, if it can’t be trained (or programmed) or if it has no likely effect on measureable customer behaviors that affect profit, it should be removed from the list. Now, consider what specific systems, knowledge and skills are required to provide the service that will influence desired customer behaviors. Consider what employee incentives will be most effective in reinforcing the use of those skills and what measurement tools need to be in place to gather the metrics to trigger appropriate rewards. Finally, link the first list (customer behaviors) to costs and revenues. To do this, calculate the financial impact of an incremental change in each item. For example, what would be the effect on revenue of increasing the average customer purchase by one dollar? What would be the effect on costs if the volume of complaints to call centers were reduced by five percentage points? It quickly becomes clear that even a small change in some customer behaviors can have a substantial financial impact. It also becomes clear which service changes will have the biggest effect. ROI CALCULATOR: See the attached spreadsheet for an example of a Customer Experience ROI calculator based on this approach. Thus far you have identified the customer behaviors you want to change, the general influence of each behavior on revenue or cost, and the dollar value of an incremental change in each behavior. The major element missing from the formula is magnitude. How much change can the company expect to create? Can complaints be reduced by 1%, 5%, 10%? Will average purchase amounts increase by 50 cents? Ten dollars? Also missing is the interaction among different variables. For example, aggressive up-selling may lead to a 10% increase in the average transaction amount, but it could also lead to a 2% increase in customer turnover, which might counteract the benefit. The only way to answer these questions is to experiment. Finally, this method excludes word of mouth customer behavior. In this ad of social media, increasing word of mouth (positive or negative) is an important customer behavior to manage. It’s been excluded from this tool do difficultly empirically measuring its benefits. See the attached post for a description of word of mouth measurement. I recently came across a very intriguing bit of research that suggests the benefits of investments in the customer experience in terms of shareholder return. Great customer service processes and people are not built overnight. They take years of investment to cultivate. Unfortunately, for some publically traded companies, the short-term demands of Wall Street make such investment difficult. The demands of investors to meet earnings estimates for the next quarter can make it difficult for managers to invest in the customer experience – the payback is too slow and uncertain. Stockholders have little patience nowadays with investments that do not show a clear and quick return. To ensure that managers are acting in the owners’ interests, management incentives are more frequently tied to quarterly financial performance than to difficult-to-measure variables like customer loyalty. Given great customer experiences are not built overnight, they are constantly at risk of budget cuts by managers who would boost short term earning at their expense. Service initiatives have a tendency to come and go in large companies before they have a chance to prove their worth, resulting in customer frustration, employee cynicism and widespread service mediocrity. Service gurus talk about the need for “investor loyalty” as a counterbalance to customer loyalty, but that requires a visionary, motivated and stable management team who can convince investors to look farther ahead. Easier said than done, right? How does one make the case for investments in the customer experience in an environment that demands making the next quarters numbers? Jim Picoult, founder of Watermark Consulting, has an answer. 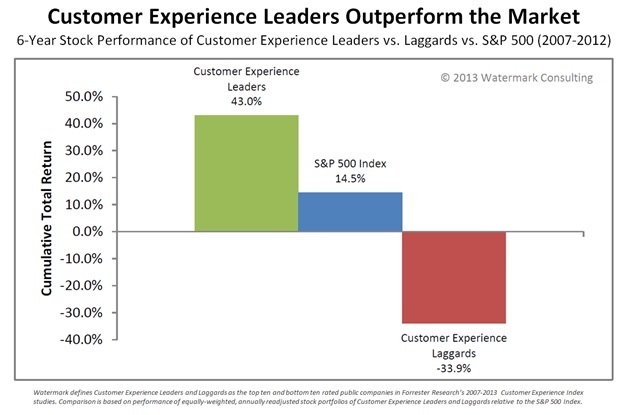 Jim has created a stock index based on Forester’s annual Customer Experience Index (CXI). Jim calculated the returns of two hypothetical portfolios consisting of the top and bottom 10 publicly traded companies in Forester’s CXI for a six year period ending in 2012. Each year he rebalanced the two portfolios based on Forester’s new rankings. The portfolio comprised of companies ranked in Forester’s top 10 yielded a cumulative return of 43%, compared to 14.5% for the S&P 500. The portfolio containing the bottom 10, yielded a cumulative return of negative 33.9% – it lost a third of its value. Now, correlation is not causation, and there are a lot of factors at play here. But clearly the managers of firms in the portfolio of Forester’s top 10 were able to both deliver shareholder value and invest in the customer experience. It all comes down to thinking of the customer as an asset in which to invest and realize a return. Research has determined the business attribute with the highest correlation to profitability is customer loyalty. Customer loyalty lowers sales and acquisition costs per customer by amortizing these costs across a longer lifetime – leading to some extraordinary financial results. Depending on the industry, a small increase in customer loyalty (5%) translates into a 25% – 85% increase in profits. Customer loyalty is driven by the entire relationship with the company. Image, positioning, products, price, cost of switching, and service all form a value equation each customer applies in their continuous decision to remain loyal. 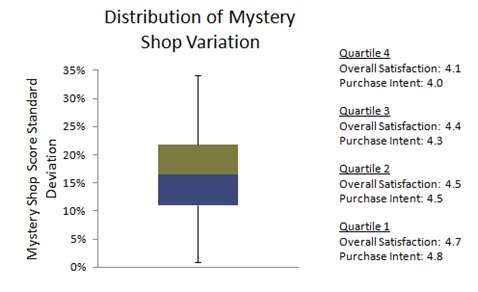 Measuring customer loyalty, however, in the context of a survey is difficult. Surveys best measure attitudes and perceptions. Loyalty is a behavior based on rational decisions customers make continually through the lifecycle of their relationship with the company. Customer experience researchers therefore need to find a proxy measurement to determine customer loyalty. One might measure customer tenure under the assumption that length of relationship predicts loyalty. However, customer tenure is a poor proxy. A customer with a long tenure may leave the firm, or a new customer may be very satisfied and highly loyal. Kinesis has had success with a model for estimating customer loyalty based on two measurements: likelihood of referral and customer advocacy. Likelihood of referral captures a measurement of the customer’s likelihood to refer the company to a friend, relative or colleague. It stands to reason, if one is going to refer others to the bank, they will remain loyal as well. These promoters are putting their reputational risk on the line founded on a feeling of loyalty and trust. This concept of trust is perhaps more evident in the second measurement: customer advocacy. Customer advocacy is captured by measuring agreement with the following statement: “The Company cares about me, not just the bottom line.” Customers who agree with this statement trust the firm to do right by them, and will not subjugate their best interests to profits. Customers who trust the company to do the right thing are more likely to remain loyal. 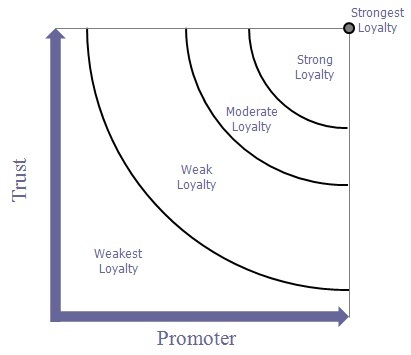 Strongest Loyalty: The strongest zone of loyalty contains cases where both the Trust and Promoter attributes received the highest possible rating. 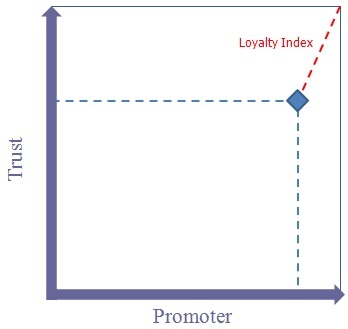 Strong Loyalty: The next zone is where the loyalty index lies within 35% of both the Trust and Loyalty axis. Moderate Loyalty: The zone of moderate loyalty is where the index lies within 60% of the highest possible Trust and Promoter ratings. Weak Loyalty: The zone of weak loyalty lies within 90% of the highest possible Trust and Promoter ratings. Weakest Loyalty: The zone with the weakest loyalty are cases where one or both of the Trust and Promoter scores are less than 90% of the highest possible for Trust and Promoter.. Given that for many industries the business attribute with the highest correlation to profitability is customer loyalty; it is incumbent upon survey researchers to gather a measure of customer loyalty as part of their customer experience measurement. Kinesis’ approach of calculating a loyalty index based on “would recommend” and “customer advocacy” ratings has proven to be a useful tool for segmenting customers by an estimate of their loyalty. The next step in this analysis is to put this segmentation to work identifying which service attributes will yield the most ROI in term of driving customer loyalty. For most service industries the business attribute with the highest correlation to profitability is customer loyalty. It is, therefore, very important to gather a measurement of customer loyalty. However, simply calculating a loyalty index is not enough. Estimating customer loyalty is important, and an obvious first step; however, alone – without any context – is not very useful. What’s needed is a methodology to transition research into action, and identify clear paths to maximize return on investments in the customer experience. What managers need is a tool to help them prioritize the service behaviors on which to focus improvement efforts. One such tool is an analytical technique called Gap Analysis. 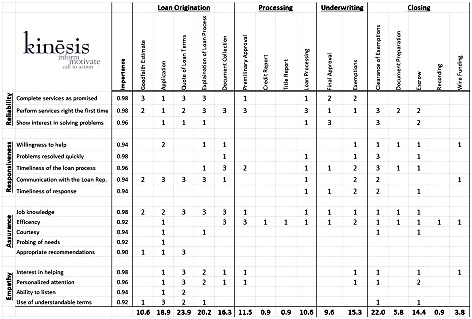 Gap Analysis compares performance of individual service attributes relative to their importance, providing a frame of reference for prioritizing which areas require attention and resources. To perform Gap Analysis, each service attribute measured is plotted across two axes. The first axis is the performance axis. On this axis the performance of each attribute is plotted. The second axis is the importance axis. Each attribute is assigned an importance rating based on its correlation to the loyalty index. Service attributes with strong correlations to loyalty are deemed more important and service attributes with low correlations are deemed less important. Quadrant 1: Areas with high correlations to loyalty and low performance. These service attributes are where there is high potential of realizing return on investments in improving performance. 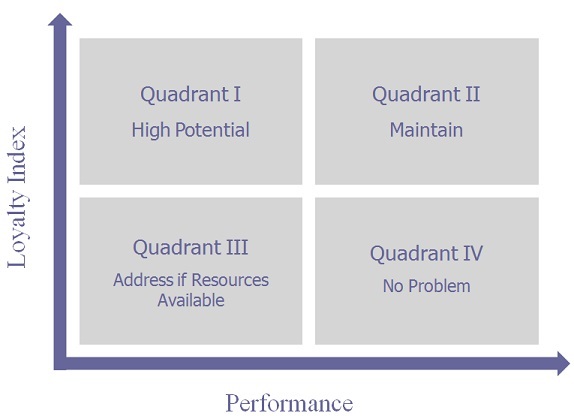 Quadrant 2: Areas with high correlations to loyalty and high performance. These are service attributes to maintain. Quadrant 3: Areas with low correlations to loyalty and low performance. These are service attributes to address if resources are available. 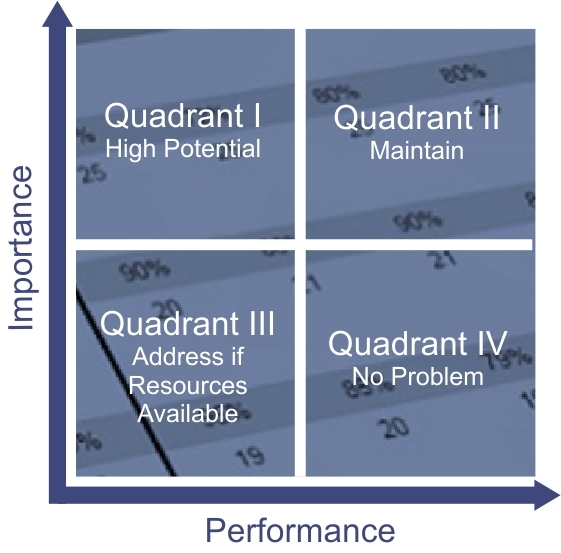 Quadrant 4: Areas with low correlations to loyalty and high performance. These are service attributes which require no real attention as their performance exceeds their importance. 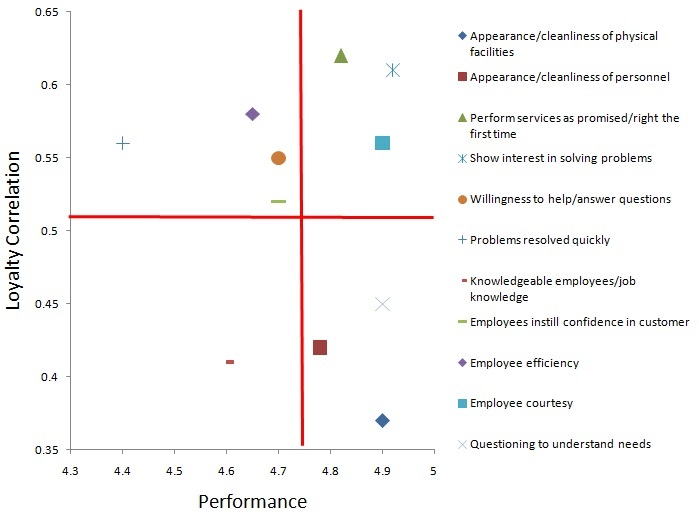 In this example, problems resolved quickly, employee efficiency, willingness to help, employees instill confidence are the four behaviors with relatively high correlations to the loyalty index and relatively low performance As a result, improvements in these attributes will yield the highest potential for ROI in terms of improving customer loyalty. Using gap analysis, managers now have a valuable indicator to identify service attributes to focus improvement efforts on. Directing attention to the attributes in Quadrant I should have the highest likelihood realizing ROI in terms of the customer experience improving purchase intent.